"The Ageless Diamond" exhibition sponsored by Christie's and De Beers in London in 1959 showed few exhibits as breath-taking as this pear-shaped diamond, weighing 79.41 metric carats, mounted as a pendant with a diamond chain. Little is known about its early history, though it is believed to have been found in the in the alluvial diamond fields in the vicinity of Golconda. Certainly both the color and quality of the gem are worthy of the source. Unlike so many fine Indian diamonds this one did not travel westwards but instead went to Nepal, situated on the north-eastern border of India, where it remained for several generations, passing from one ruler and potentate to another. In 1957 Harry Winston purchased the Nepal from an Indian dealer, and had it slightly recut from its original weight of 79.50 carats. 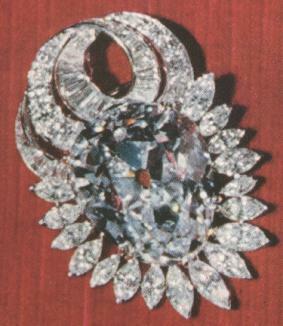 In 1958 the stone was featured in an issue of National Geographic magazine which quoted that Harry Winston wanted $500,000 for the stone, set in the pendant in the above photo. After "The Ageless Diamond" exhibition he sold the diamond to a European client. It was set as a pendant to a V-shaped diamond necklace that also contained 145 round diamonds weighing a total of 71.44 carats.